Famed genealogist and author Arthur Kurzweil will give the keynote presentation, “Jewish Genealogy as a Spiritual Pilgrimage,” at the Jewish Historical Society of Greater Hartford’s Family History Day, on Sunday, May 2. His book, “From Generation to Generation,” was one of the first books on Jewish genealogy and inspired a generation of individuals to begin their journey of discovery (including Tracing the Tribe). He was also among the founders of the very first Jewish genealogical society, in New York City. Kurweill will also be the scholar-in-residence at this summer’s 30th IAJGS International Conference on Jewish Genealogy – JGSLA 2010 – July 11-16, Los Angeles. The venue is Beth El Temple in West Hartford, from 12.30-5pm. Kurzweill will also lead two workshops at the event. One will be for experienced genealogical researchers and one to help those discover what happened to relatives during the Holocaust. Fee: members, $12; others, $15. View the event brochure here for complete information on all 10 workshops and registration. Family History Day is an opportunity for adults and middle- and high-school aged children to learn how to save family memories and treasures for future generations. The program will include 10 expert workshops on topics including conducting an effective interview; writing your own memoir; conducting genealogical research; archiving precious photos, papers and artifacts; and creating keepsake memories. A vendor showcase will display products and services related to genealogical research. He was interviewed – “Jewish genealogy as a spiritual pursuit” – in the Jewish Ledger. Among his other books: “On the Road with Rabbi Steinsaltz: 25 Years of Pre-Dawn Car Trips, Mind-Blowing Encounters and Inspiring Conversations with a Man of Wisdom;” “The Torah for Dummies,” “The Encyclopedia of Jewish Genealogy” and “My Generations: A Course in Jewish Family History,” a popular text used for almost two decades in North American synagogue schools. An accomplished magician, he is also coordinator of the Talmud Circle Project, directed by Rabbi Steinsaltz. He received the Distinguished Humanitarian Award (Melton Center, Ohio State University) for his unique contributions to Jewish education, and the IAJGS Lifetime Achievement Award. When I began investigating my family history I found that there were no guidebooks. I ended up writing the book I wish I had been able to find. How does an absolute beginner start? The first step is to talk to relatives. That’s always the first step. The documents will wait. The people don’t wait. Talk to every relative you can find. Talking to relatives is the most important thing to do. After that, I’d say you should explore http://www.jewishgen.org. This is cyberspace headquarters for Jewish genealogy. If you are interested in Jewish genealogy and you go to this website, we won’t see you again for months! It seems to me that every step of the way when we pursue our genealogical research, we are involved in mitzvahs. Who more than we honor the elderly? Who more than we reach out to the elderly people in our family and our communities and make them feel like we need them – because we do. And what is that but a mitzvah, to honor the elderly. Who more than we ask questions? The Talmud consists of questions, thousands of ways of asking different questions. Did you ever ask the question, “Where did you get that information from?” Well, there is a little code word in the Talmud for the question, “Where did you get that question from?” And who has perfected the art of asking questions more than we have? Learn how to share and preserve family memories in a digital age with speaker Daniel Horowitz at the San Francisco Bay Area Jewish Genealogical Society’s Peninsula branch in Los Altos, on Monday, April 19. Doors open at 7pm, the program begins at 7.30pm at Congregation Beth Am, 26790 Arastradero Road, Los Altos Hills. Today researchers have many options for storing and sharing research material, including text, images, videos, documents and sound. Today’s tools range from “capturing” devices (such as audio/video recorders, cameras, mobile phones and scanners) to products for sharing (such as CDs, DVDs, portable disc, electronic photo frames) to the Internet itself. For many, the Internet is the perfect place to share and preserve memories. Publish your material in a range of ways, from those that are completely private to completely public, everything between. Ask for collaboration or confirmation or simply display the information; and you can control every aspect. Many easy-to-use tools and resources can facilitate the work of setting up websites, blogs, wikis or any other ways to publish the information. Learn the different available options, establish your goals and decide the best way to publish your research and collected materials, and allow the younger generations to enjoy, help and collaborate in your project. Born and raised in Caracas,Venezuela, Daniel Horowitz and his family have lived in Israel since 2005. He is translation and database manager at MyHeritage.com, a genealogical social networking site with many exciting features for connecting families around the world. He’s a computer instructor and teacher/creator of the Searching for My Roots genealogy project for young people. A founder/lecturer for the Jewish Genealogical Society of Venezuela, he’s a member/webmaster of the Israel-based IGS/JFRA society and the Horowitz Family Association. He’s a frequent lecturer at international Jewish and general genealogy conferences and is a board member/webmaster of the International Association of Jewish Genealogical Societies (IAJGS). Fee: Attendance is free to all. For more information, contact the SFBAJGS vice president and branch chair Rosanne Leeson. Professional photographer Rich Santich will cover copying and preserving old photographs at the next meeting of the Jewish Genealogy Society of Cleveland, on Wednesday, April 7. The program begins at 7.30pm in the Miller Board Room at Menorah Park, 27100 Cedar Road, Beachwood. 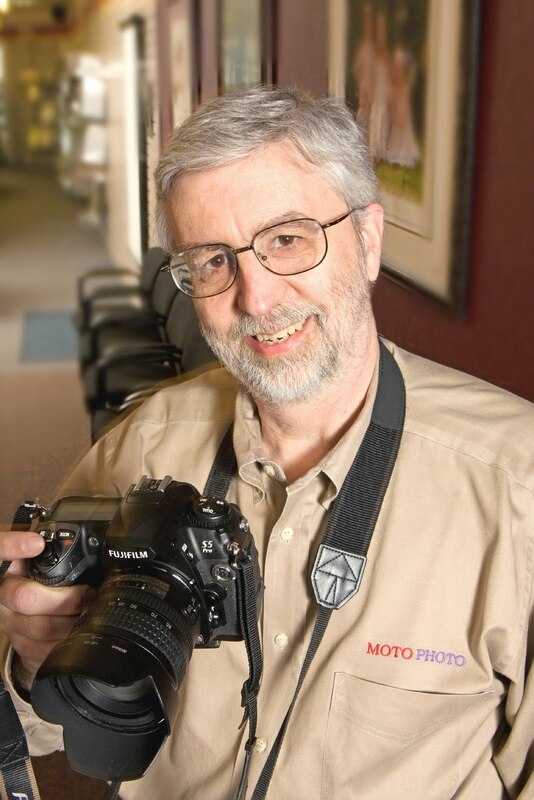 Santich runs MotoPhoto in Shaker Heights and will demonstrate what individuals can do themselves and what can be done professionally. MotoPhoto is a photo processing firm and provides other professional photographic services. He will demonstrate how to copy and/or preserve old family photographs that researchers find among our family possessions. Those individuals who are so inclined, or willing to learn, a few basic computer skills can often do much of the work themselves when it comes to copying old photos. Others may be more inclined to have the duplicating done professionally. Santich will cover the various options as well as offering basic tips on the preservation of historic family photo heirlooms. Click here for more information on the JGS of Cleveland. Check out their online resources, such as grave photographs and obituaries. Following a relatively comfortable – although 10 hours long – flight from Tel Aviv, Hong Kong International Airport is an eye-opener. Having grown up with JFK and LAX airports, “busy” was not an unknown quantity, but this airport is something else. An immense physical space filled with crowds of people. Despite some long walking stretches, escalators up and down and a train to another terminal, everything was very efficient. The car service driver was waiting for me when I emerged from baggage claim. I had been expecting cold, wet weather, but it was a warm 20C following yesterday’s cold 8C, the driver told me. The 40km drive from the airport to the hotel in Mid-Levels was fast, no traffic at all, until we hit HK proper. It was a bit misty – think Los Angeles morning mist – but the hills were spectacular, as well as the views from the bridges. This large bustling city is filled with very tall, slender buildings. When you don’t have much land, the only way to go is up. Mira Hasofer, the Hong Kong Jewish Community Center’s program director, called to make sure everything was fine and to confirm our arrangement to meet at the JCC’s traditional Sunday night BBQ dinner. It was a short walk up (emphasis on the “up” as in “up hill”) from the Bishop Lei hotel as I had to stop at a few places along the way looking for nail polish remover. My brand-new manicure had completely distintegrated. Three shops, not one had any remover at all, not even one bottle. Tomorrow I may just go for a new manicure. Downstairs, I met Mira, her attorney husband Menachem and her father Moshe. Originally from Sydney, Mira and Menachem, have been in HK about eight years and have three young children, the youngest only 3 months. Mira introduced me to a number of community members who were also enjoying this Sunday night tradition, including Rabbi Stanton M. Zamek and Rabbi Martha Bergadine of the United Jewish Congregation and their two children. Rabbi Zamek is the Purim Spiel person. I’m looking forward to attending that production! I especially enjoyed meeting Mira’s father, Moshe. His family originally left Bushehr (southern Iran) in 1904 for Palestine, then to Bombay. Regular readers of Tracing the Tribe may remember that the ancestors of Samy Yecutieli (Caracas, Venezuela) were also from Bushehr. I wouldn’t be surprised to learn that the two families knew each other back then. Moshe’s family went to Bombay and back to Israel again. We kept wandering in and out of Farsi mixed with Hebrew and English. Moshe knew our cousin Sassoon z”l Menashy’s father, Menashe, in Bombay. Menashe – son of Moshe ben Israel Dardashti – was a wedding singer and sang at most of the community’s events. Moshe’s father was also a singer and participated in those events. Visiting HK and looking for a kosher BBQ buffet dinner? Visit the Jewish Community Center on Sunday nights, from 6-10pm. It’s also a good place to meet the friendly local community. The chefs barbecue on the patio outside, and treats include meat, chicken, turkey, fish, a chicken wok dish (as well as baked potatoes, french fries and other treats). There’s also pasta, various salads and platters of delicious fresh salmon sushi and sashimi as well as baked salmon. Don’t miss the desserts, there’s a fudgy brownie cake that is a MUST, along with other sweet treats and fruit. The buffet, in the Garden Room, has a view of the 150-year-old Ohel Leah historic synagogue (see photo above left). Mira’s husband Menachem explained that there are few buildings of that age left in HK. In the absence of zoning restrictions, they’ve most all been torn down to put up new towering buildings. Ohel Leah was named for the mother, Leah Gubbay, of of David Sassoon’s three grandsons. The land where the synagogue stands was purchased when the site was far above the city, and given to the Jewish community. The foundation stone was laid May 1901; it was dedicated April 1902. 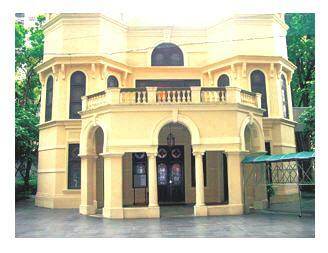 In 1905, the Kadoorie family funded the Jewish Recreation Club on part of the synagogue grounds. Its facilities included a large hall, restaurant, bar, library and billiards room, a tennis court and a wide lawn with Victoria Harbour views. Originally a Sephardic community, Ashenazim from Eastern Europe arrived during the 1880s, 1890s, and 1930s. In 1937, property below the club was given to the community by J.E. Joseph. Named Beit Simcha – in memory of his mother – the property was purchased to preserve the harbour view, to house the rabbi, along with a ground floor mikvah. During World War II, HK was occupied by the Japanese, community members were placed in POW camps; the synagogue was requisitioned by the Japanese. The Torah scrolls were smuggled out and hidden during the war. The synagogue did not have serious damage but the Club was destroyed. In 1949, the Kadoorie famiy funded a new club on the same site. Menahem said that when the Sassoons first bought the land, the area was not desirable and no one wanted to live there. Today, however, the neighborhood is a prime district filled with beautiful tall apartment buildings. There’s more to the saga. The Club included a large field gradually surrounded by these tall blocks. The once-undesirable plot of land was now worth a pile of money. The community’s Trustees of the community decided to develop the land. In partnership with a local developer, two residential towers were built, with a percentage of the apartments in the two 40-story towers belonging to the Trust. Also part of the agreement with the developer was that a Jewish Community Center be built. Today, the facility has some six floors, including a Jewish day school, library, kosher supermarket, meat and dairy restaurants, an indoor swimming pool, function rooms and offices. It is also completely wireless! There was some controversy over whether the historic synagogue should be preserved or destroyed. Luckily, it was preserved, and completely renovated while retaining the original feel. In 1997 work began and the building was rededicated on October 18, 1998. In 2000, UNESCO Asia-Pacific Heritage Awards recognized the conservation and restoration project with an Outstanding Project Award for Cultural Heritage Conservation. The JCC also has the Sabra Coffee Shop – a glatt kosher meat restaurant that also offers a Wednesday evening buffet, the Waterside Restaurant (informal dairy) and the Coffee Bar. The facilities also include a Kosher Mart retail shop. There are seven synagogues in Hong Kong today. Ohel Leah, three Chabad branches, and a Progressive/Reform congregation. The community even has a glossy magazine, Jewish Times Asia, the first – and only – regional community publication, distributed in nine countries. Tomorrow, I’m doing the Escalator Walk with a community member and we’ll visit The Lanes – lots of shops. Mira assures me that on the way back there are some excellent manicure places, so I may do that. There is a Hong Kong Jewish Historical Society, and more on that later in the week. Artist and genealogist Susan Weinberg of Minnesota spent six weeks studying Yiddish at the Vilnius Institute and also visited Dunilovichi, Belarus, during the summer of 2009. While there, she made a copy of the 1834 census for Dunilovichi, which has 375 entries and some 60 surnames. 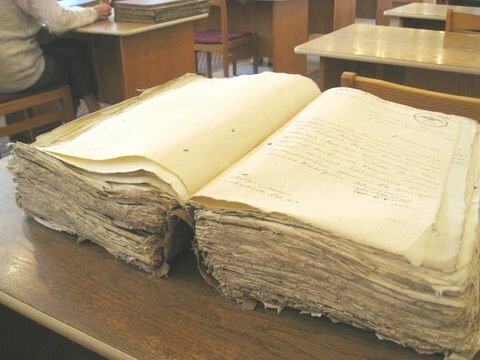 Susan would like to have it included – to benefit other researchers – on JewishGen’s All Belarus Database, but there is a cost to get the translation done. She has already created a ShtetLinks page for the town with extensive information (see link below). Readers with roots in the area may wish to contribute to this effort. It is 82 miles N of Minsk, 80 miles ENE of Vilnius, 18 miles WSW of Hlybokaye (Glebokie) and 16 miles ESE of Pastavy (Postawy). Interestingly, Tracing The Tribe had a TALALAY branch that lived in Glebokie for a short period of time. 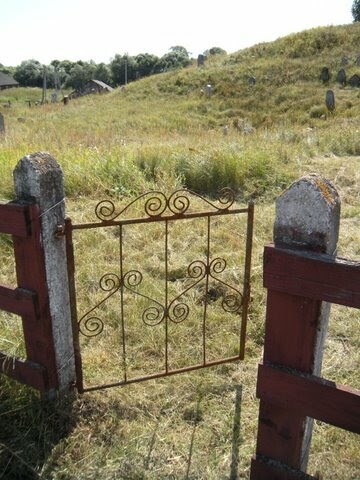 She also visited the Dunilovichi cemetery, but it was nearly impossible to walk through as it was so overgrown and stones have fallen (see above photo). 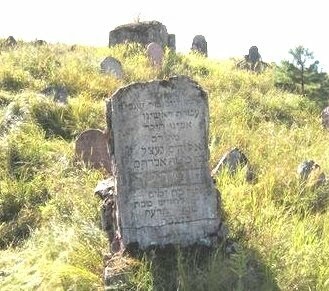 Susan reports that there is now an opportunity to work with the Jewish Heritage Research Group of Belarus to arrange for an annual site clean-up, during which vegetation would be cut back and fallen stones lifted. “We are fortunate that there is an intact cemetery in this shtetl as so many others have been destroyed,” she writes. Photos on these pages were received from Susan, who writes that she would very much appreciate the efforts of Tracing the Tribe and its readers to assist in both these projects. The Dunilovichi site contains extensive information, including name lists, gravestones, families, maps, photographs and more. Contact Susan directly for more information. She researches and paints her family history, which focuses on Poland, Ukraine and Belarus. During her Vilnius summer, she conducted research in the archives and traveled to her family’s Belarus shtetls. Since her return, Susan has created Shtetlink websites for Dunilovichi and Radom, published an article in Avotaynu and is now developing a body of artwork based on her travels. Her art addresses family history themes through painting and collage. She also does genealogy consulting and lectures frequently on genealogy topics. Additionally, Susan is a geneablogger – see her Layers of the Onion: A Family History Exploration. She began blogging last summer when she studied Yiddish at the Vilnius Yiddish Institute for six weeks.